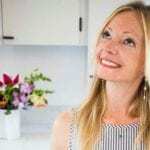 After the author dealt with the initial shock of a serious diagnosis, she took her health into her own hands and learned how to use nutrition to heal. At the age of 33, I was diagnosed with Barrett’s Esophagus Disease. Even as a health coach and wellness enthusiast, I literally had no idea what it was. It took a while to really grasp it, but in short, Barrett’s is caused by chronic acid reflux, and the condition predisposes those affected by it to esophageal cancer. When I got the news, I was terrified and overwhelmed. Despite having been sick for nine months, I wasn’t even slightly relieved to receive this diagnosis. I thought any news would feel like good news, but this was foreign—and let’s be real: We tend to fear things we don’t understand. My first reaction was denial: But wait! I’m a yogi, and a runner and surely those things are enough to combat all of the damage I’ve done to my body over the years! But it wasn’t. I’ll be living with a precancerous condition and taking medication for the rest of my life. In my younger years, I was very fiery and ambitious (not always in the best ways). For whatever reason, I didn’t really get that I needed to reel it in as I got older. I worked hard and played hard in high school, college, and beyond. I said yes to literally everything, which resulted in a lot of stress on my body and my mind. The years between 2014 and 2017 were especially intense. I met the love of my life, a man I am thrilled to now call my husband. Fast forward about six months, and my company was acquired, which was great, but stressful—new job, new boss, new workflow, new office. Six months after that, I got engaged, and we immediately started planning our wedding. I should mention that said wedding was to occur in eight short months, on the opposite side of the country (I don’t recommend this!). Around this time, I started really feeling anxious and I lost track of what was important. I stopped getting my period (which is still missing, sadly), and it became really uncomfortable for me to eat. I lost a lot of weight. The hardest part of this story to tell, to really write about, is that I have a history of extreme food restriction (in high school I was anorexic for about a year, weighing in around 88 pounds), and these patterns were resurfacing. In hindsight, my disordered eating probably contributed the most to this whole situation, and I truly believe that receiving this diagnosis was the only thing that could possibly get me to finally make peace with those issues. I hid behind my seemingly “healthy” habits for so long, but eventually, my body couldn’t take it anymore. It broke. I should have stopped. I should have slowed down, postponed the wedding, taken care of myself, but I didn’t want to let anyone down, so I kept going. I was so sick on my honeymoon I may as well have not even been there, and I was there… in the South of France, and in Paris! This should have been the happiest time of my life, but I felt awful. However, I was determined to power through, put on a happy face and push myself to the point of extreme pain. Surely I would reach the other side of this soon. Four months after we returned from our honeymoon, my husband I started the process of buying a home. If you’ve ever purchased real estate in Los Angeles, well, you get it. I was so ill from stress by the end of that process that my husband had to handle all of the paperwork for us. I was sick more often than I was well. I had a brief moment of almost normalcy after we had settled into the new house. It was a relief, I mean, I’m good now, right? Enough change. I started feeling better for a while, but it didn’t last long, and eventually I needed some answers. The reason I went in for an endoscopy in the first place was because after a year of feeling continuously really, really sick, I had had enough. I would lie on the floor at night sobbing, saying over and over, “I just want my life back.” I had totally lost the excited, happy, energetic person I used to be. I was ill. By now I had lost so much weight, and was starting to have weird aversions to food. I ate very little during the day (because eating hurts a lot when you have Barrett’s), and at night I would drink just enough wine to make it tolerable for me to consume an average sized meal. Essentially, my coping mechanism for all of the pain I would experience during eating, was to do very little of it. I was starving myself, partially because I needed to in order to manage the pain physically, and partially because I, quite frankly, was still anorexic. I made an appointment with a Gastroenterologist because it got to a point where I was throwing up almost everything I ate. I thought I has IBS, colitis, or something “manageable.” When my diagnosis came in, I freaked out, because I had no idea what I was dealing with, but ultimately, this illness was a gift. It was just what I needed in order to finally start rebuilding my life. I learned that the way I had been eating (mostly paleo and moderate dairy) was the worst thing I could do for acid reflux, and started feeding myself in a totally different way. Small meals throughout the day, lots of veggies and low-acid fruits, lean protein (chicken and fish mostly), and pretty much stopped drinking wine (a glass here and there is tolerable for me now). I saw a psychiatrist and started working through my stress issues. I learned the importance of self-care, and finally started practicing what I had been preaching for so many years. I started sleeping for the first time in over a year. If I had waited much longer, the outcome could have been much worse. I would have been in a more advanced stage of this disease. Within two months of starting my medication (yes, I now have to take medication for the rest of my life) I felt so much better. I didn’t get the old me back, but what I got is better. I’m happy. I’m relaxed. I love my work and I feel that I am contributing to my company in a more productive way than I was when I was overcome with anxiety and running on empty. Everything in my married life has changed, from what and where we eat, to our morning and evening routines; even the way we treat and live in our home. It’s all for the better. I am slowly recovering from my anorexia, and I am beginning to see the light at the end of the tunnel. My hope is that someday, with the help of my acupuncturist and doctors, I’ll start having periods again. In June, I had my follow up endoscopy, and it showed no changes for the worse. I can now go on with my (new, modified) life for the next two years before I need to get another test. It’s OK to turn to Western medicine when we really need it. But I can assure you, if I start feeling unwell before that, I won’t push down the pain, I will ask for help. I wanted to share my story, mainly, because there is always a silver lining, and I encourage you to find it. The lesson here is simple: Listen. Slow Down. Ask for Help. Love Yourself—for real. Never give up on yourself, and always advocate for your health, because no one else can do it for you. Michaela is a certified holistic health and lifestyle coach through the Institute of Integrative Nutrition, and a registered yoga teacher. She lives in Los Angeles, CA, where she work as the Account Director for Integrated Partnerships at Wanderlust. In addition to her dedicated yoga practice, Michaela loves music, travel, cooking and eating healthy food (of course), and spending time with her family and friends.